Belfast Giants made it two wins from two Continental Cup games with a 6-2 victory over CSKA Sofia in Bremerhaven. Darryl Lloyd and Mark Garside netted for Belfast before Vladimir Antipov pulled one back for the Bulgarians. Lloyd completed his double and Jeff Mason added the fourth with Stanislav Muhachev making it 4-2 before goals from Mike Kompon and Calvin Elfring. The Giants take on German hosts Bremerhaven on Sunday night in their final group game. 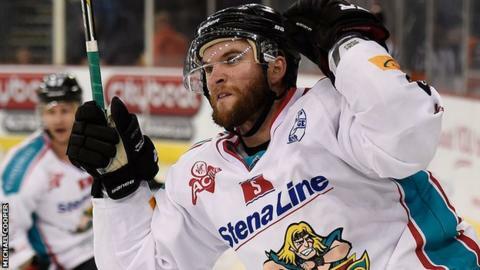 Belfast opened their Continental Cup bid with a 4-1 win over Tilburg Trappers on Friday. Lloyd fired home at 15:10 and it was 2-0 to the Elite League champions three minutes later with Garside on target from an Adam Keefe assist. Antipov shot high into the Giants net with only 10 seconds left in the first period. Lloyd was on target again midway through the second period, tapping in on the powerplay. It was quickly followed by Mason's goal, again on the powerplay, but Sofia halved the deficit through Muhachev three seconds before the end of the second period. Kompson's wrist shot on 46:07 restored Belfast's three-goal advantage and Elfring completed the scoring with four minutes left.